Bio-methane gas generated from dairy and food waste would be transported to campus with tube trailers. MIDDLEBURY, Vt. - Middlebury College and Integrated Energy Solutions (IES), a Vermont developer of farm-based methane energy, have agreed to explore a bio-methane gas collection and delivery system that could help Middlebury further reduce its use of fossil fuels. Middlebury has agreed to purchase bio-methane gas from IES over a 10-year period, with the agreement contingent on the college raising money to build storage facilities for the gas on campus and retrofit its current heating plant to burn the new fuel, and on IES attracting financing for construction of bio-methane production facilities at farms in Addison County. The project would cost about $9 million, with $2 million coming from Middlebury and $7 million from IES. Both Middlebury and IES hope that their agreement will provide a boost to the fledgling farm-based methane industry, which uses cow manure and food waste to produce methane gas, and which promises to help support Vermont dairy farms while providing a renewable fuel source that could power the college's boilers and possibly its vehicles. "The bio-methane project could further reduce our reliance on fossil fuels and move us closer to our institutional goal of becoming a carbon-neutral campus by 2016," said Middlebury College President Ronald D. Liebowitz. "This investment would also be a reflection of our commitment to support a more diverse and vibrant Vermont economy whenever it is consistent with the college's broader educational mission." IES, based in Montpelier, has been working with Vermont dairy farmers since 2006 to promote energy efficiency and capitalize on the potential for on-farm renewable energy production. "This partnership provides us with the opportunity to demonstrate that farm-based methane can be produced collectively from a number of dairy farms," said Dan Smith, IES president and founder, "and that renewable natural gas produced by the IES system can provide a viable alternative for businesses looking to replace their dependence on fossil fuels with locally produced renewable fuel." "This project not only will help Middlebury College meet its inspirational carbon neutrality goals, it will do this while helping to support the local farming community," said Sen. Patrick Leahy. "This is the kind of cost-effective and creative energy solution we need to support our local communities, economies and environment." Under the terms of the agreement, IES would supply the college, each year for 10 years, with renewable natural gas in an amount equivalent to 650,000 gallons of heating oil. 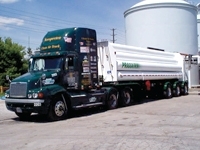 If all goes as planned, IES could begin delivering renewable gas as early as the fall of 2011. The Middlebury-IES project would create compressed bio-methane, also known as renewable natural gas, using manure from Addison County dairy farms, and food waste from select area businesses. The material would be processed through a "biodigester" located on one or more of the local farms. The gas produced from the combined waste stream would be scrubbed of impurities by a "gas upgrade" plant connected to the digester, producing pipeline grade bio-methane, the chemical equivalent of natural gas. The gas would be transferred and shipped by tank trucks to a central receiving site near the campus, which could also serve as a vehicle fueling station. From there, the gas would be transported through an underground pipeline to the college's central heating plant. Much like the college's biomass plant, which opened in February 2009 and replaces fuel oil with locally-harvested wood chips for energy production, the bio-methane option would further diversify the college's fuel portfolio, cut down on the use of fuel oil, reduce net emissions of carbon dioxide, and help stimulate a local, renewable energy economy. For more information on the Middlebury-IES agreement, contact Stephen Diehl, Middlebury College Communications, 802.443.5629. For information about IES, contact Dan Smith at 802.229.6661, or Steve Terry, Worth Mountain Consulting, 802.310.3987.